There are a number of things that can trigger the decision to remodel or move to a new home. Perhaps you have outgrown your current space, you might be tired of struggling with ancient plumbing or wiring systems, or maybe your home just feels out of date. The question is: Should you stay or should you go? 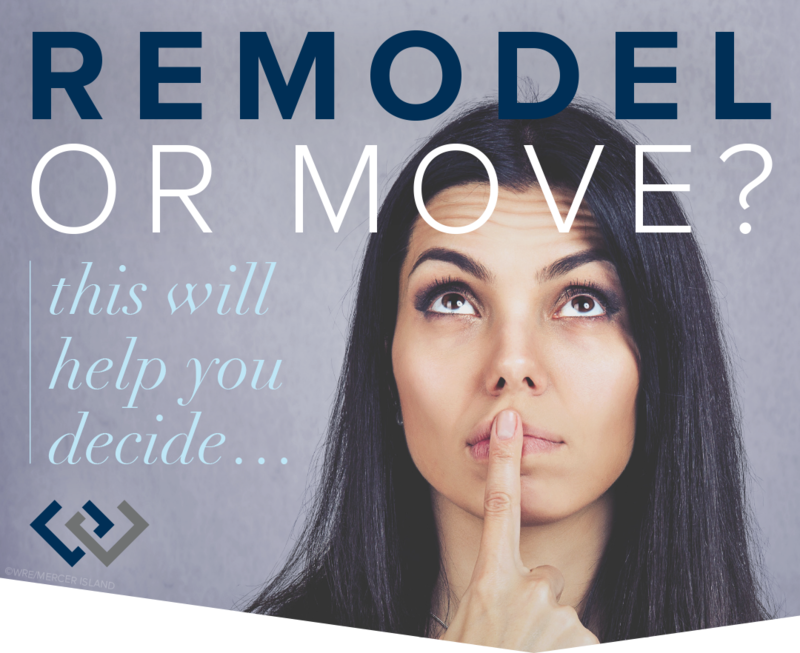 Choosing whether to remodel or move involves looking at a number of factors. 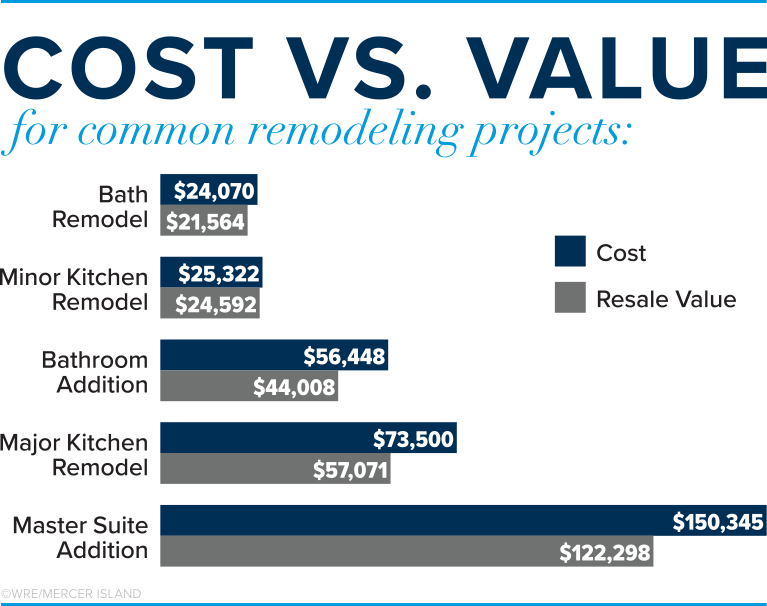 Cost vs. value is a big consideration—check out the chart below or click here to view Remodeling Magazine’s full 2019 Cost vs. Value Report showing the cost and resale value of 21 projects in the Seattle area. 1. Your current location just isn’t working. Unruly neighbors, a miserable commute, or a less-than-desirable school district—these are factors you cannot change. If your current location is detracting from your overall quality of life, it’s time to consider moving. If you’re just ready for a change, that’s a good reason, too. Some people are simply tired of their old homes and want to move on. 2. Your home is already one of the nicest in the neighborhood. Regardless of the improvements you might make, location largely limits the amount of money you can get for your home when you sell. A general rule of thumb for remodeling is to make sure that you don’t over-improve your home for the neighborhood. If your property is already the most valuable house on the block, additional upgrades usually won’t pay off in return on investment at selling time. 3. There is a good chance you will move soon anyway. If your likelihood of moving in the next two years is high, remodeling probably isn’t your best choice. There’s no reason to go through the hassle and expense of remodeling and not be able to enjoy it. It may be better to move now to get the house you want. 4. You need to make too many improvements to meet your needs. This is particularly an issue with growing families. What was cozy for a young couple may be totally inadequate when you add small children. Increasing the space to make your home workable may cost more than moving to another house. In addition, lot size, building codes, and neighborhood covenants may restrict what you can do. Once you’ve outlined the remodeling upgrades that you’d like, a real estate agent can help you determine what kind of home you could buy for the same investment. 5. You don’t like remodeling. Remodeling is disruptive. It may be the inconvenience of loosing the use of a bathroom for a week, or it can mean moving out altogether for a couple of months. Remodeling also requires making a lot of decisions. You have to be able to visualize new walls and floor plans, decide how large you want windows to be, and where to situate doors. Then there is choosing from hundreds of flooring, countertop, and fixture options. Some people love this. If you’re not one of them, it is probably easier to buy a house that has the features you want already in place. 1. You love your neighborhood. You can walk to the park, you have lots of close friends nearby, and the guy at the espresso stand knows you by name. There are features of a neighborhood, whether it’s tree-lined streets or annual community celebrations, that you just can’t re-create somewhere else. If you love where you live, that’s a good reason to stay. 2. You like your current home’s floor plan. The general layout of your home either works for you or it doesn’t. If you enjoy the configuration and overall feeling of your current home, there’s a good chance it can be turned into a dream home. The combination of special features you really value, such as morning sun or a special view, may be hard to replicate in a new home. 3. You’ve got a great yard. Yards in older neighborhoods often have features you cannot find in newer developments, including large lots, mature trees, and established landscaping. Even if you find a new home with a large lot, it takes considerable time and expense to create a fully landscaped yard. 4. You can get exactly the home you want. Remodeling allows you to create a home tailored exactly to your lifestyle. You have control over the look and feel of everything, from the color of the walls to the finish on the cabinets. Consider also that most people who buy a new home spend up to 30 percent of the value of their new house fixing it up the way they want. 5. It may make better financial sense. In some cases, remodeling might be cheaper than selling. A contractor can give you an estimate of what it would cost to make the improvements you’re considering. A real estate agent can give you prices of comparable homes with those same features. But remember that while remodeling projects add to the value of your home, most don’t fully recover their costs when you sell. © Copyright 2019, Windermere Real Estate/Mercer Island. Text originally posted on Windermere.com. Remodeling data © 2019 Hanley Wood Media Inc. Complete data from the Remodeling 2019 Cost vs. Value Report can be downloaded free at www.costvsvalue.com.